YourStreet is a Google Map mash-up that informs you about what’s going on in your town and neighbourhood by geo-tagging thousands of articles, blogs, and discussions at street level. Google Maps Mania reviewed YourStreet when it launched last year and now we are happy to bring you news of a major new redesign of the site. 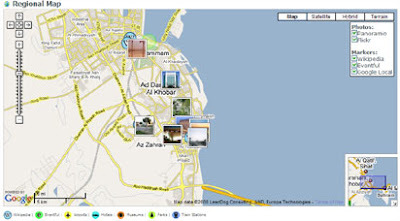 An innovative drag and drop interface for adding content to the map lets users simply drag pins onto a map. User generated content is highlighted on the right side of every page. Local discussions and neighbour activity is given new prominence on the site, emphasizing user contributions. Users can filter news by topic. For example, you can just view New York crime news if you wish. Popular articles, discussions, and active neighbours are now highlighted, allowing users to find the most viewed items on the site. Every location now has separate news, discussion, and neighbours tabs at the top of the page to enable users to more easily find out what's going on around them. All content areas fit on one screen. With the new design there is a minimum of scrolling necessary. You simply click the next button to view the next screen of information. Page loads are minimized. Extensive ajax has been implemented throughout the site to reduce page loads and significantly speed up the user experience. We have introduced map-based advertising via a partnership with Lat49. As you drag the map, the ad unit below the map changes to reflect the location you are viewing. This will allow us to serve up more highly geotargeted ads to users. We now have local news headline widgets for every town and thousands of neighbourhoods in the country. Users can paste these into a web page or blog to have continuously updated articles displayed for their specific location. Mapdango is a Google Maps mash-up that lets users quickly, and easily discover information about any city or town in the world. Google Maps Mania originally reviewed Mapdango back in January but has recently undergone a revamp. 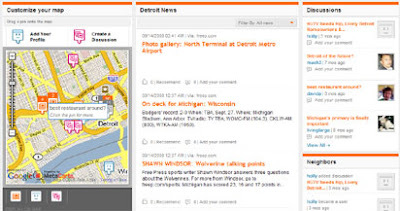 Now when you search for a place on Mapdango you will receive information from Panoramio, WeatherBug, Flickr, Eventful, Google Local, YouTube, Geonames, and a whole bunch of other APIs, including FriendConnect. Content on the site is broken into three categories, based on a 'dashboard', a map, and a social view. Also included is a country/city index for major cities, and an RSS feed that shows a new randomly selected place every day. Thanks for the coverage on mapdango, Keir. Looking forward to reading your other posts! baraaza.com and mapmyrun.com are two cool site that I use with google maps. Baraaza is a cool new travel site and map my run does exactly what it says, maps your run.